FASTDOT aims to provide the best user experience possible, that’s why we guarantee that you get the resources you pay for with your Virtual Dedicated Servers, just as if you were on a traditional dedicated server setup. Although the FASTDOT Cloud Cluster is multi-tenanted, each Virtual Dedicated Server is as secure as if they were separate machines. With policies employed and the resources are partitioned in such a way that one Virtual Machine’s activities cannot negatively affect the others. 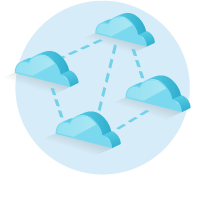 Each Cloud Virtual Machine provides complete account isolation. FASTDOT’s VDS hosting environment employs enterprise-level virtualization techniques (VMware ESXi) where virtual machines have fully independent dedicated operating systems and dedicated resources. This provides more control, flexibility and greater levels of reliability and performance compared to a dedicated server. The technology behind FASTDOT’s Virtual Dedicated Servers offers a solution with enterprise level cloud hosting features geared towards high availability. Cloud Solutions not only represent a more efficient use of resources than typical physical servers, they also allow you to build in redundancy far more easily. This will give you much greater reliability within the hosted VDS solution. VDS hosting environments are geared towards more robust, resource-intensive applications and offers the perfect entry point into enterprise-grade Visualization.